Most words with the spelling ⟨wh⟩, such as what, where, and whale, were still pronounced [ʍ] ( listen), rather than [w] ( listen). That means, for example, that wine and whine were still pronounced differently, unlike in most varieties of English today. The "retroflex R": [ɻ] ( listen). In Early Modern English, the precise nature of the light and dark variants of the l consonant, respectively [l] ( listen) and [ɫ] ( listen), remains unclear. The modern English phoneme /aɪ/ ( listen), as in glide, rhyme, and eye, was [ɘi] and later [əi]. Early Modern rhymes indicate that [əi] was also the vowel that was used at the end of words like happy, melody and busy. /aʊ/ ( listen), as in now, out and ploughed, was [əu ~ əʊ] ( listen). /æ/ ( listen), as in cab, trap and sad, was more or less the same as the phoneme represents today. /ɛ/ ( listen), as in fed, elm, and hen, was more or less the same as the phoneme represents today or perhaps a slightly higher [ɛ̝] ( listen), sometimes approaching [ɪ] ( listen) (as it still retains in the word pretty). /eɪ/ ( listen), as in name, case and sake, was a long monophthong, approximating [ɛː] ( listen), perhaps at first more open, such as /æ/ ( listen) (with Shakespeare rhyming words like haste, taste and waste with a fronted last and shade with sad), and later less open, such as [ɛ̝ː] ( listen). The phoneme was just beginning or already in the process of merging with the phoneme [ɛːi] ( listen) as in day, pay, and say. Depending upon the exact moment or dialect of Early Modern English, met was a potential homophone with mate; the same was true for even mat and mate. Such an open pronunciation remains in some dialects, notably in Scotland, Northern England, and perhaps Ireland. /iː/ ( listen) (typically spelled ⟨ee⟩ or ⟨ie⟩) as in see, bee and meet, was more or less the same as the phoneme represents today, but it had not yet merged with the phoneme represented by the spellings ⟨ea⟩ or ⟨ei⟩ (and perhaps ⟨ie⟩, particularly with fiend, field and friend), as in east, meal and feat, which were pronounced with [eː] ( listen) or [ɛ̝ː]. However, words like breath, dead and head may have already split off towards /ɛ/ ( listen)). /ɪ/ ( listen), as in bib, pin and thick, was more or less the same as the phoneme represents today. /oʊ/ ( listen), as in stone, bode and yolk, was [oː] ( listen) or [o̞ː] ( listen). The phoneme was probably just beginning the process of merging with the phoneme [ou], as in grow, know and mow, without yet achieving today's complete merger. The old pronunciation remains in some dialects, such as in Yorkshire and Scotland. /ɒ/ ( listen), as in rod, top and pot, was [ɒ] or [ɔ] ( listen). /ɔː/ ( listen), as in taut, taught and law, was [ɔː] or [ɑː] ( listen). /ɔɪ/ ( listen), as in boy, choice and toy, is even less clear than other vowels. By the late-16th century, the similar but distinct phonemes /ɔɪ/, /ʊi/ and /əɪ/ all existed. By the late-17th century, only /ɔɪ/ remained. Because those phonemes were in such a state of flux during the whole Early Modern period (with evidence of rhyming occurring among them as well as with the precursor to /aɪ/), scholars often assume only the most neutral possibility for the pronunciation of /ɔɪ/ as well as its similar phonemes in Early Modern English: [əɪ] (which, if accurate, would constitute an early instance of the line–loin merger since /aɪ/ had not yet fully developed in English). /ʌ/ ( listen) (as in drum, enough and love) and /ʊ/ ( listen) (as in could, full, put) had not yet split and so were both pronounced in the vicinity of [ɤ] ( listen). /uː/ ( listen) was about the same as the phoneme represents today but occurred in not only words like food, moon and stool but also all other words spelled with ⟨oo⟩ like blood, cook and foot. The nature of the vowel sound in the latter group of words, however, is further complicated by the fact that the vowel for some of those words was shortened: either beginning or already in the process of approximating the Early Modern English [ɤ] ( listen) and later [ʊ] ( listen). 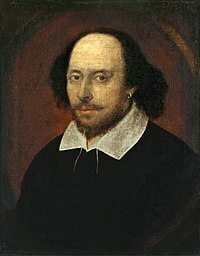 For instance, at certain stages of the Early Modern period or in certain dialects (or both), doom and come rhymed; this is certainly true in Shakespeare's writing. That phonological split among the ⟨oo⟩ words was a catalyst for the later foot–strut split and is called "early shortening" by John C. Wells. The ⟨oo⟩ words that were pronounced as something like [ɤ] ( listen) seem to have included blood, brood, doom, good and noon. Also, this period reveals a curious case of one of the earliest Russian borrowings to English (which is historically a rare occasion itself); at least as early as 1600, the word "steppe" (rus. степь), first appeared in English in William Shakespeare's comedy "A Midsummer Night's Dream". It is believed that this is a possible indirect borrowing via either German or French. This page was last edited on 25 April 2019, at 10:37 (UTC).